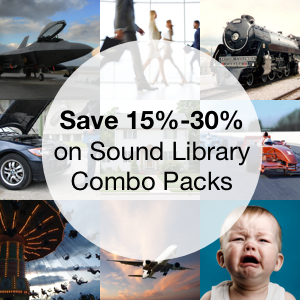 Today Airborne Sound is offering a gun sound library for immediate download, completely free of charge. It is called The Free Firearm Sound Library – Expanded Edition. 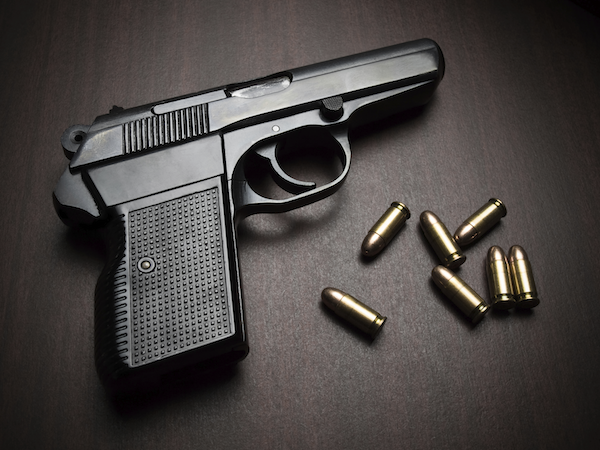 It contains more than 1,100 files in over 7 gigabytes of gun recordings. 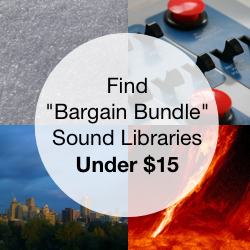 This collection includes bonus sound files, documents, and freshly revised metadata previously unavailable elsewhere. This post will share details about the collection, and why it is now available on Airborne Sound. Of course, some of you may recognize this library from its release earlier this year. It isn’t one of my own. The Free Firearm Sound Library was recorded and produced by Ben Jaszczak and Brian Nelson of the sound design company Still North SoundFX. It was released earlier this year as part of a Kickstarter campaign funded by the community. It’s a collection of gun handling Foley and handgun, shotgun, and rifle gunfire. It has been available free of charge since its release. Now, I’m a big fan of Still North SoundFX’s community-driven approach of creating sound collections. I’m also a fan of the library, too. I’ve dug through every clip. I’ve used the sounds in my own projects. However, I realized that not everyone may know that this great community resource exists. 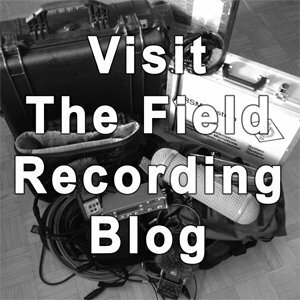 As many of you may know from my field recording blog, I believe the whole craft of pro audio improves when better sound surrounds us. Now that the press from original project has died down, I wondered how others could take advantage of this collection of rare sound fx. The library is governed by a Creative Commons CC0 licence, which means the creators have voluntarily waived the rights to the library to make it an “open-source” creation. I asked the creators how they would feel about sharing the library via Airborne Sound with the aim of putting the library in the ears of as many people as possible. By all means, please do! We really don’t stand to benefit or collect anything from people downloading from our site. [With] the CC0 license we have no control over the library anymore, and the only limitation is that it cannot be sold. So, thanks to the generosity of the creators, The Free Firearms Sound Effects Library – Expanded Edition is now available as a free download from Airborne Sound. 192 kHz/24-bit WAV files (with some 96 kHz tracks). 13 fields of Soundminer metadata. A spec sheet with more information about the guns and firearm manufacturers. Download The Free Firearm Sound Library – Expanded Edition now, or read on to learn more about the Expanded Edition. The Expanded Edition includes more than 300 new processed gunshot sound fx in over a gigabyte of audio. They are my own interpretation based on the original clips. What’s new? The original team delivered gunshot versions with moderate, sensible processing. They’re reliable takes. I also include my own stylized interpretation that pushes the gunshots hard. The new clips focus on power, presence, and oomph. They’ve had the stuffing processed out of them for one purpose: to convey power. Don’t look for realism in these bad boys. Instead, you’ll find crunchy, powerful, biting blasts. Use them as boosters, sweeteners, or the basis for sound design weapons if you want to add a stylized aspect to your gunfire. The audio preview above will give you a taste of the new gunshot processing. The clips are prepared at 192 kHz/24-bit to assist you processing them further or to pitch them, if you like. The gunshots have been trimmed and cut into discrete, drag-and-drop takes with extended, clean tails free of footsteps and moves. The new, processed files are intended to slide right into your projects without additional mastering. I found a few extra Foley tracks hidden in the gunshot recordings. I split them out into their own files. They feature natural external reverb. The library also includes an optional MP3 version of the tracks. The original raw tracks had occasional pops and clicks at the head, tail, and within the tracks. These have been removed. Line hum existed on some takes. This has been excised. Recordist moves, incidental room noise, and stomach gurgles have been removed from the Foley takes. Redundant pre-roll dead air in one-off, unpaired takes has been removed. This reduced the library bloat by over 300 megabytes of space and slimmed down the library size by almost 7%. Residual moves following the gunshots have been removed to extend the length of the tail/fade out. Some gunshot tracks have had (careful!) de-noising applied. The metadata has been revised and expanded. It is an update to the metadata I contributed to the library earlier this year. It fixes spelling, adds new metadata fields, includes descriptive notes, images, and much much more. Names and terms (such as caliber and gun type) are now consistently labelled to meet gun hobbyist standards. This improvement sorts the library nicely to assist with searching. The sound file names are now unique and descriptive. The library is organized by gun type (instead of model) to make it easier to find closest-possible-match gun styles. 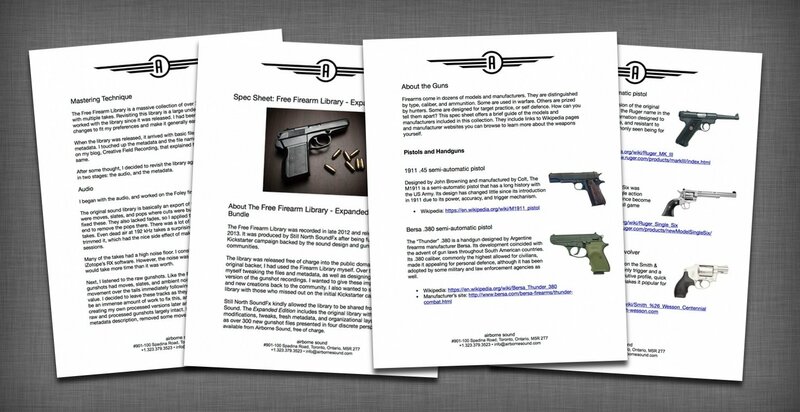 The collection now includes a 15-page “spec sheet” PDF which helps you understand each gun’s function and purpose to provide context to help you in your projects. The Free Firearms Sound Effects Library – Expanded Edition will always be a free sound library. It was designed to be a community resource. You’re welcome to take this library and share it yourself however you like. The creators have only one restriction: the library must be shared free of charge. This includes anything I’ve added to the collection. Any modifications I’ve added to the Extended Edition are in the public domain. None of this would have been possible without the hard work of the original field recording team. A heartfelt thanks to Still North SoundFX for creating the collection and for their kind permission to share the sound library. Download The Free Firearm Sound Library – Extended Edition. If you’d like to download the original sound library without my changes, you can download it from Still North SoundFX’s website. Still North SoundFX also have another library in the works, The Medieval Weapons Sound Library. Check it out and support them!